The Cowboys vs Eagles is this week’s NFL matchup, with the former team visiting their bitter NFC East rival in Philadelphia this Sunday night. The Cowboys vs Eagles odds are certainly enticing. Huge advantage right from the get-go for the Eagles as they come off a bye week. Meanwhile, it’s a short one for Dallas. Nothing ticks off a head coach more than having to play a team off a bye week, especially with the double-whammy of a short one, too? We’re sure Jason Garrett won’t have pleasant things to say about his team’s schedule. Past results can be important when handicapping teams. But last year’s split between the Cowboys and Eagles was all but worthless. Philly won easily in Big D when the Cowboys were playing their worst football of the season without then-suspended star running back Ezekiel Elliott. Dallas, meanwhile, won a 6-0 snoozer in Philadelphia to close the regular season. That was meaningless for both as the Cowboys were eliminated from the playoffs and the Eagles locked into their playoff seed, and thus rested or barely played key guys. The difference in time off can’t be overstated. 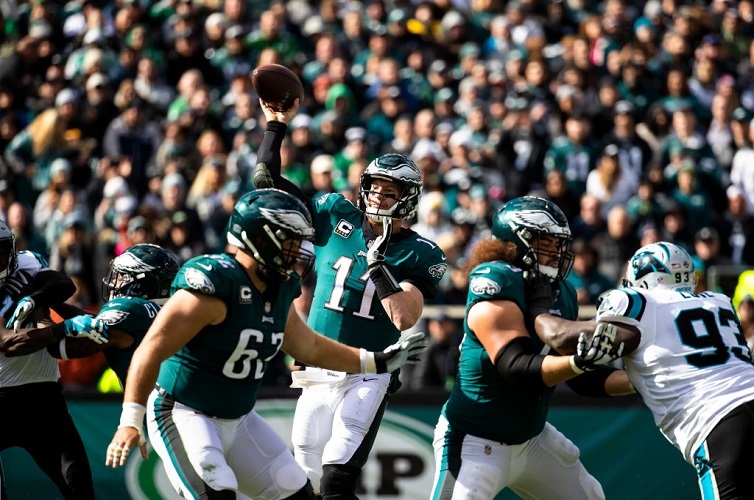 It’s Philadelphia’s first home game off a bye since 2013, but the Eagles are 9-1 straight up in their past 10 in that scenario and have covered in seven. Quarterback Carson Wentz already is having a huge season in completing 70.7 percent of his passes with a QB rating of 109.6, but he will add a new asset in one of the league’s better slot receivers, Golden Tate. He was acquired from Detroit before last Tuesday’s trade deadline for a 2019 third-round pick. That’s a steal for a team with Super Bowl aspirations. The Eagles aren’t running the ball much, so Tate is another passing option, alongside WRs Alshon Jeffery and Nelson Agholor. Tight end Zach Ertz actually leads the Eagles in catches, targets and yards. Philly lost deep threat WR Mike Wallace to a broken leg in Week 2. Tate is one of the NFL’s best in yards after the catch from the slot. The Cowboys’ playoff hopes took a massive hit on Monday night, and so did Garrett’s chances of being back in 2019. Go find a Cowboys’ message board or anything on social media. It is full of fans clamoring for owner/GM Jerry Jones to fire Garrett. Dallas kept shooting itself in the foot in Monday’s 28-14 home upset loss to Tennessee. They barely managed more than 100 total yards in the second half and completely going away from its best offensive player, Elliott, after intermission. It was a truly puzzling game plan in Dallas’ first home loss of 2018. WR Amari Cooper had a TD catch in his first game as a Cowboy, but wasn’t a huge factor otherwise. The NFL odds have this line rising in large part because of how the Cowboys looked Monday – it opened as low as Eagles -4.5 at some books. The total has been stable. The Cowboys have lost five straight (1-4 ATS) in their past five as a road underdog. Philadelphia is 6-2 ATS in its past eight night games. The favorite has covered the past five in the series.